I read Inara Pey’s post “A Split Screen double in Second Life” in her blog and decided to visit this sim at LEA 15. According to Inara LEA 15 is a temporary home for Dividni Shostakovich’s Split Screen. Split Screen Installation Space is a curated place for artists to develop large installations, often not possible in the physical world. At LEA 15 there’re two installations “EveryWhere and NoWhere” by JadeYu Fhang and “The Games We Play” by Krystali Rabeni. Both can be accessed via teleporters from the landing point and with teleporters from eachother. “EveryWhere and NoWhere” by JadeYu Fhang is the larger installation which spreads over several levels. Most of it is held in white and light blue giving the impression of being in a cold, maybe winterly world. There are ladders that connect the levels. They seemingly end into nothing, but from their end you fall on another (invisible) level to walk upon. The female statues look like altered dolls, some like modern interpretations of gods of the Greek mythology. Some statues hoover headlong, others seem to climb up a never ending staircase or elevator. It’s hard to interpret what you see and that might be intended. There’s no notecard or description for this installation nor did I find information about the artist JadeYu Fhang. And the title “EveryWhere and NoWhere”? This place is for sure not from our physical world, hence it is NoWhere and you find elements from EveryWhere. “The Games We Play” by Krystali Rabeni is a comparably small installation, a game of chess but not on a flat board. 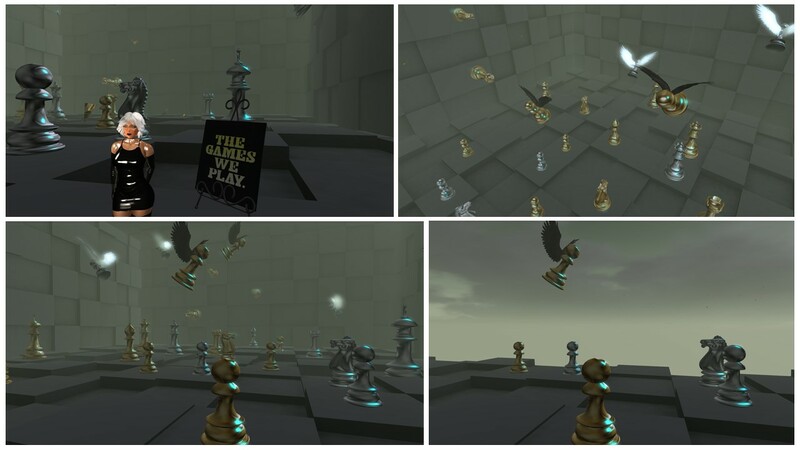 The board has several levels and the chessmen are also moving up the vertical walls and the pawns are flying above the scenery. It looks busy. Again no information about this installaion nor about the artist. For another interpretation look at Inara Pey’s blog post. She added her thoughts. According to her Information LEA 15 will stay open until End of September 2017. Both installations offer many opportunities for taking pictures and for experiencing 3D art in Second Life. Thank you Dividni Shostakovich for providing the space within LEA 15. Thank you JadeYu Fhang and Krystali Rabeni for the art. I enjoyed a lovely break in my Second Life exploring it.